Depression is one of the most common mental health problems today. Studies show that 16.2 million adults in the United States have experienced a major depressive episode in the past year. Health professionals estimate that 15% of all adults living in the United States will experience depression at some point in their lives (here for more statistics on depression). While medications are effective in assisting you to feel better, there are other options useful in helping to ease depression. 1. Talk therapy has been found to be one of the most effective treatments for depression. Talking with a counselor allows you to let out buried emotions, worries, and negative thoughts and discuss situations that seem to worsen your depression. All of this is done in a safe, non judgmental environment with a counselor who can help you to learn tools to better manage your depression. 2. Eating well is important in managing your depression. Eating a healthy, balanced diet affects well being and your thought patterns. It is important to eat regularly and not skip meals. Eat balanced meals with quality food and save sugary treats for special occasions. 3. Get consistent and uninterrupted sleep. If you lounge around in the bed during the day or take naps this could worsen the depression. Try to wake up at the same time each morning and go to sleep at the same time each evening. No heavy meals right before laying down and try to stop screen time an hour prior to bedtime so the brain can begin to unwind. 4. Practice self care. Be kind to yourself. Discover what things calm you and improve your mood. It might be a bubble bath, essential oils, scented candles, or spending time outside. Find activities that help you to unwind. You might enjoy listening to music, gentle walking, or reading. Schedule downtime for yourself daily. It's amazing how much a difference a few minutes of self care each day can make in managing your depression. 5. Practice self-acceptance. Beware of how others may try to define you. No one is perfect. You have strengths, but also areas to grow in. Your personality, character, background and all that makes up you, is unique to you. When you make a mistake, guard yourself from talking negatively to yourself. Learn how to treat yourself as a best friend. 6. Reach out and connect with others. Depression can sometimes make you feel alone. Cultivate a positive support circle of family members and friends. Enjoy getting together with those people in your life. Think about connecting on another level by participating in volunteer work. Churches, non profit agencies, and schools are often looking for volunteers of all kinds. Giving to others and interacting with others helps you to stretch out of self and brings a sense of newness into your life. If you struggle with depression and want to learn more about the best practices to manage your condition, call Arise Counseling Services today at 251-216-9653 for a free 15 minute consultation call or contact me via the website here. 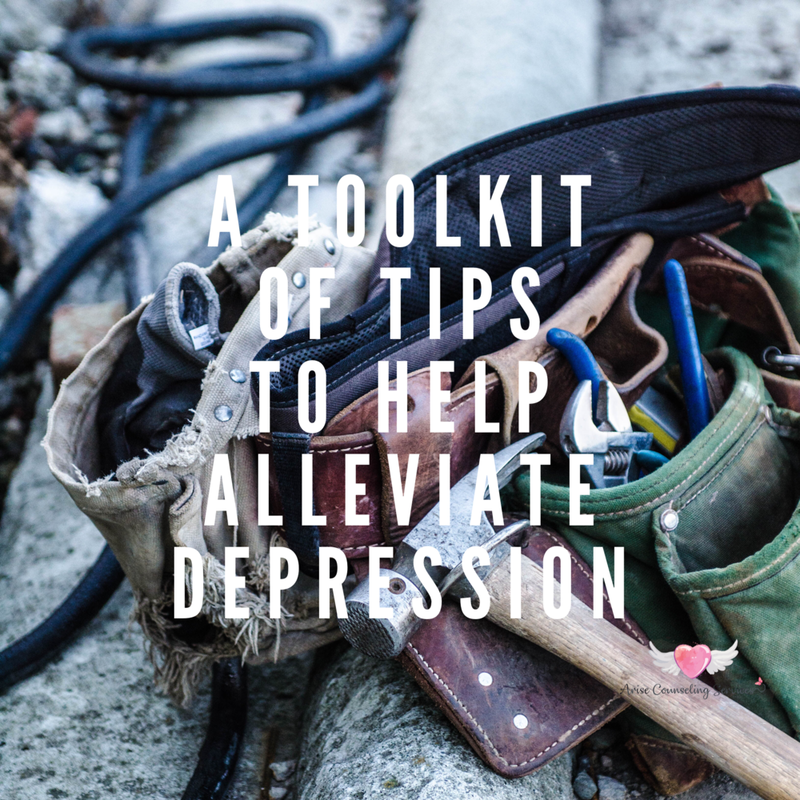 Meeting with a counselor is a step ahead in filling your toolbox with the practical knowledge of how to help alleviate your depression.